With a world class performance at the Riva del Garda ITTF World Juniors SUN Yingsha (CHN) secured 3 gold medals..
On the Girls’ Singles battle for Gold with Wang Manyu, Sun Yingsha added another title to top off her breakthrough year. She defeated 2-time World Junior Champion Wang Manyu 4-3 and claimed the Girls’ Singles title. Already on an outstanding semi-final, Sun Yingsha recovered from 1-3 to eliminate teammate Qian Tianyi 4-3, showing she has what it takes to be the very best in the World. She also claimed the Girls’ Doubles title alongside Shi Xunyao, overcoming teammates Wang Manyu & Qian Tianyi 4-3. 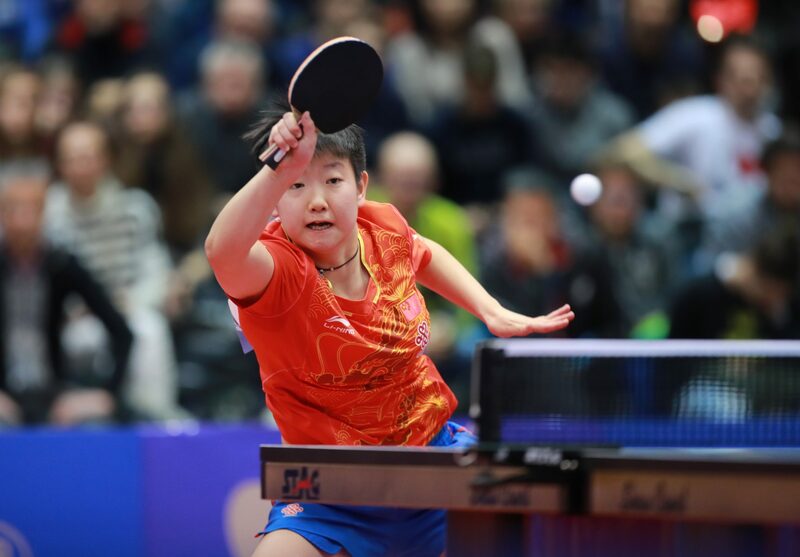 Last but not least Sun Yingsha was unstoppable at the 2017 ITTF World Juniors as she additionally claimed the Junior Worlds Girls’ Team Title in Riva del Garda, Italy. It takes something special to win three titles at World Championships. SUN Yingsha has entered the dance of the best and we look forward to follow her progression..